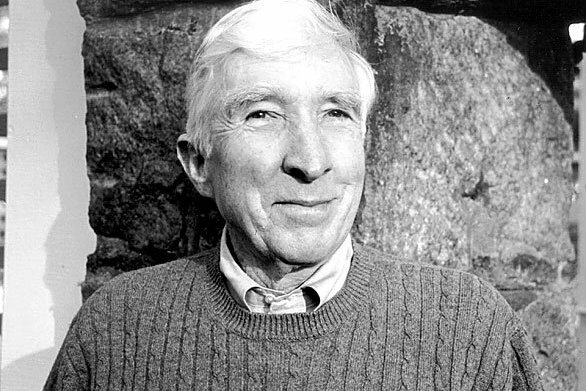 Pennsylvania is the fourth most-decorated literary state in the U.S.
Pennsylvania native John Updike has won the National Book Award six times. Pennsylvania ranks fourth among states producing the most decorated authors. LitHub compiled a list of which states housed the most literary masterpieces, as determined by the winners of the Pulitzer Prize, the National Book Award, and the National Book Critics Circle Award. Unsurprisingly, New York produced the most award-winning authors and poets, starting in 1921 with Edith Wharton for "The Age of Innocence," which won the Pulitzer that year. Authors in the state have won 71 total literary awards — including the "The Friend" by Sigrid Nunez, which won the National Book Award this past year. California produced 29 masterpieces, notably from authors and poets like Robert Frost and John Steinbeck. Illinois followed close behind with 28. But in Pennsylvania, which has clocked 24 masterpieces since 1919, author of the "Rabbit" series John Updike took the most awards. Updike, who grew up in the Reading area and based many of his works on the ideals of suburban Pennsylvania, won the NBCC, Pulitzer and National Book Award for "Rabbit is Rich," the third of his four-part series. The most recent winner of the National Book Award for poetry from the state was Daniel Borzutzky in 2016 with "The Performance of Becoming Human." And the year before, the Pulitzer for poetry went to Gregory Pardlo for "Digest." New Jersey made the list with 17 notable authors and their works, including Philip Roth's "American Pastoral" and Joan Sibler's "Improvement."